Hello OCC Friends!! We would like to thank all those that stopped by and played along with us in 2009!! We wish you all a wonderful new year blessed with good health and LOTS of happiness!! 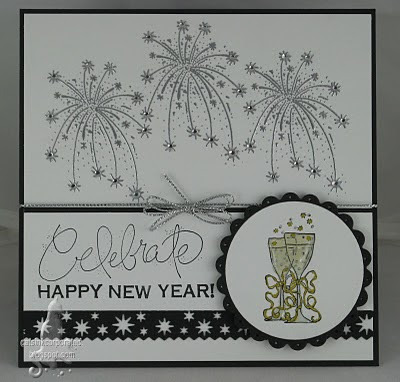 Here is the last sketch challenge of the year, we hope to see you all in 2010!! Happy New Year!! Welcome OCC friends and thanks for stopping by Our Creative Corner! 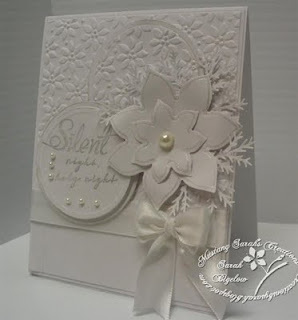 We would like to thank all those that stopped by and joined us last week for our Snow Theme Challenge, your samples were Wintry and Wonderful! 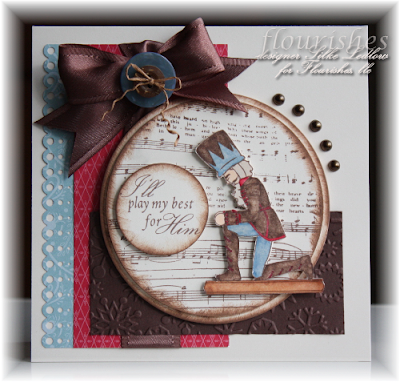 Before we start this week’s samples, we would like to introduce our feature designer, America from Cards by America. Below you will see her beautiful sample from last week's Snow challenge. 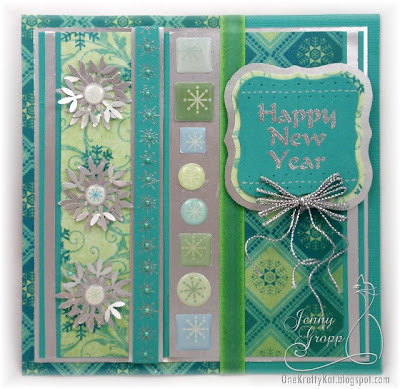 Please stop by her blog for more inspiring ideas and designs. This week our December host, has created a "Food and Drink" Challenge! Most have us have been indulging in both this week.... so let's keep they party going! 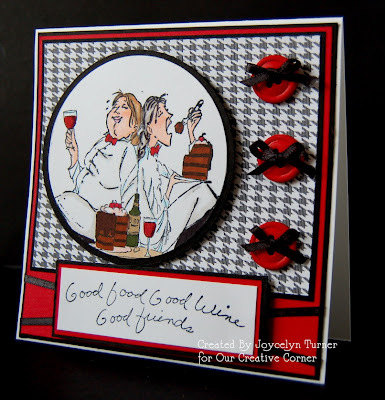 Incorporate some kind of food or drink image on your card or project. 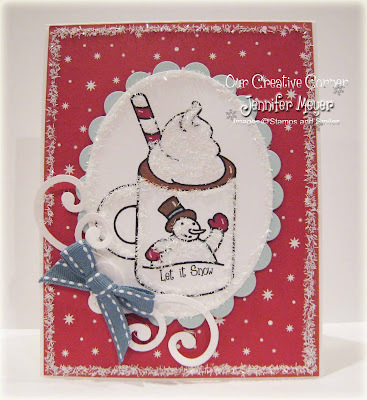 OCC Challenge - Let it Snow! Welcome OCC friends and thanks for stopping by Our Creative Corner! We would like to thank all those that stopped by and joined us last week for our Holiday Theme Challenge, your samples were so Festive! 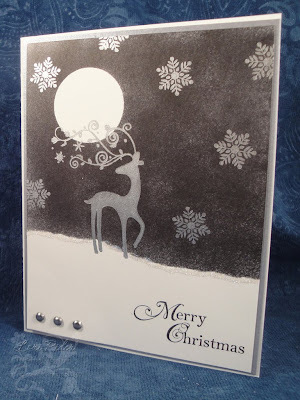 A $25 Gift Certificate from Totally Stampalicious was up for grabs with last week's Challenge and the winner is.......Player #136 Gloria Stengel, and you can find her great designs on her blog Scraps of Life! Again we thank Totally Stampalicious Stamps for sponsoring last week's Challenge. Please email us to claim your prize. Before we start this week’s samples, we would like to introduce our feature designer, Sarah from Sarah's Creations. 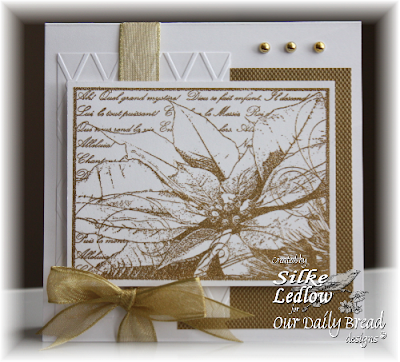 Below you will see her beautiful sample from last week's Holiday challenge. 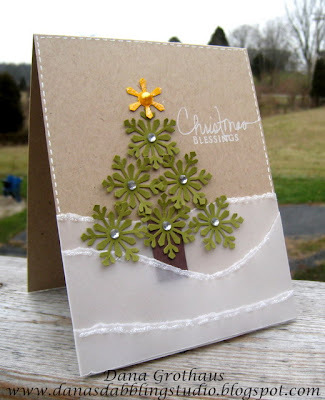 Please stop by her blog for more creative ideas and designs. This week our December host, has issued the call to "Let it Snow!". Everyone is crazy busy this time of year crossing things of our lists and preparing for the Holidays! 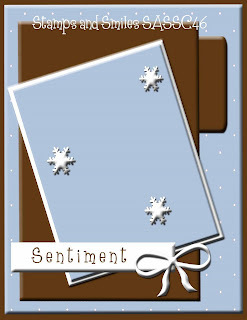 So today is another easy one, create a winter themed card featuring snow or snowflakes somewhere on your project. 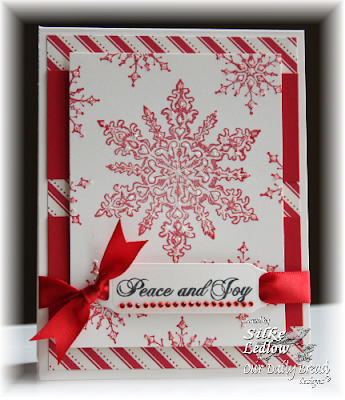 OCC Challenge -- The Holidays are Here!!! Welcome OCC friends and thanks for stopping by Our Creative Corner! 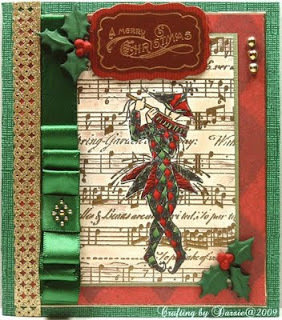 We would like to thank all those that stopped by and joined us last week for our sketch challenge, your samples were so inventive usign the 12 Days of Christmas as Inspiration!! 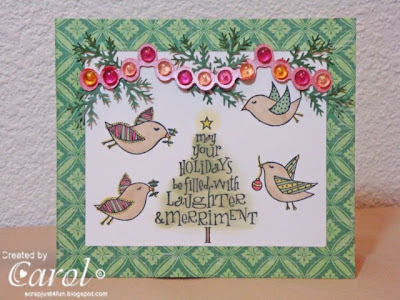 A $25 Gift Certificate from Prickley Pear Rubber Stamps was up for grabs with last week's Challenge and the winner is.......Linda R, and you can find her great designs on her blog My Happy Place! 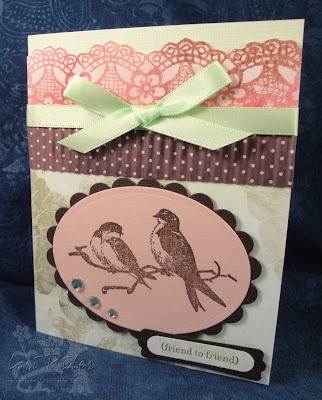 Again we thank Nicole at Prickley Pear Stamps for sponsoring last week's Challenge. Please email us to claim your prize. Before we start this week’s samples, we would like to introduce our feature designer, Darsie Bruno. 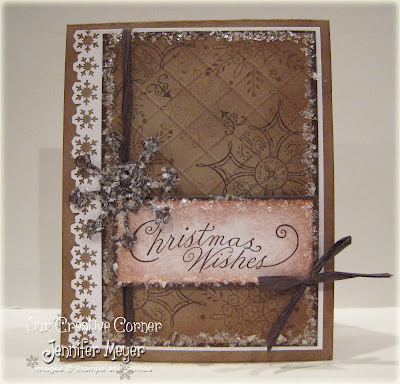 Below you will see her beautiful sample from last week's 12 Days of Christmas challenge. 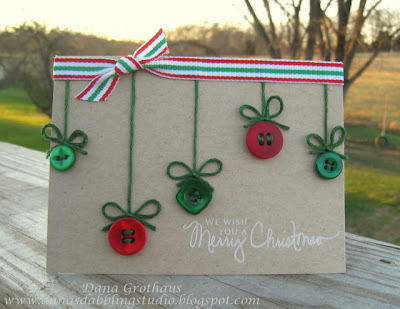 Please stop by her blog for more creative ideas and designs. 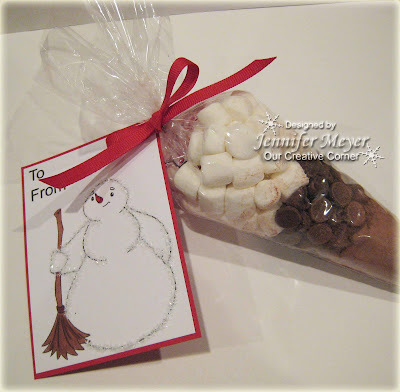 This week our December host, Jenny has us all in the Holiday Spirit with a Holiday Challenge. Everyone is busy this time of year doing last minute cards and crossing things of our lists! So today is an easy one.... 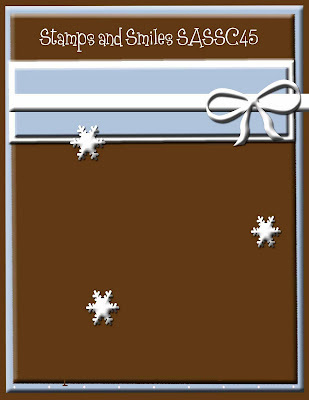 Create a card or project with a Holiday Theme, Christmas or Hannukah. And we have another Gift Certificate up for this week's challenge. Play along and link your creation below using Mr. Linky for your chance to win. 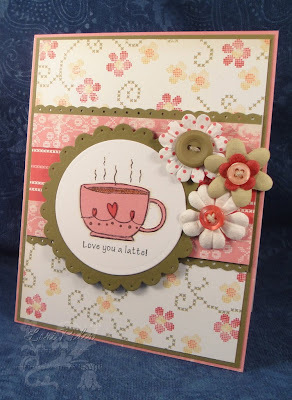 A $25 Gift Certificate is up for grabs from Totally Stampalicious, a new and FUN line of stamps! The winner will be announced next Saturday with the next OCC Challenge. 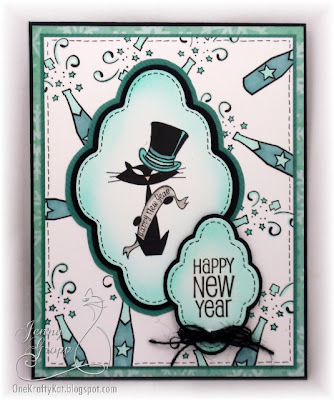 Now let's check out the samples from the OCC, our December host, Jenny Gropp - One Krafty Kat, will start us off. Hello OCC friends!! With everyone being so busy with the holidays, our weekly Sketch Challenge will be posted on the right side bar until the end of the year. We warmly invite you to play along, feel free to use your favorite stamps and supplies. 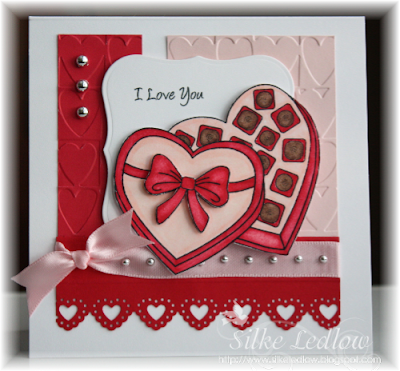 For more idea's using this sketch & our Featured Designer, please stop by the Stamps and Smiles Blog. 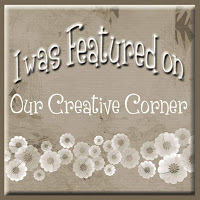 Welcome OCC friends and thanks for stopping by Our Creative Corner! We would like to thank all those that stopped by and joined us last week for our sketch challenge, your samples were so creative!! 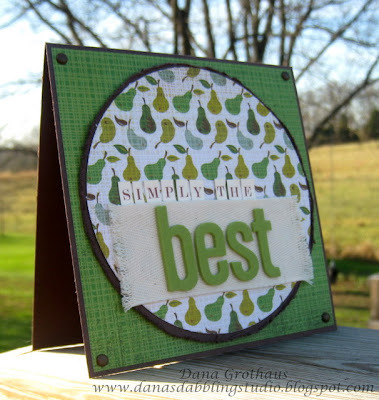 Before we start this week’s samples, we would like to introduce our feature designer, Shelley Germann from Stampin' Garden. Below you will see her beautiful sample from last week's sketch challenge. 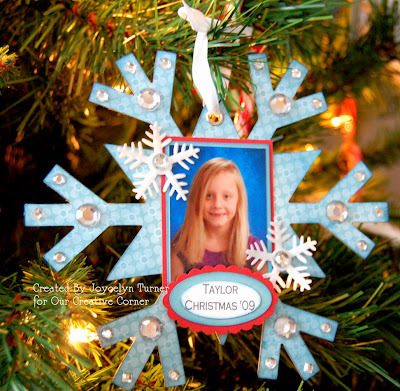 Please stop by her blog for more creative ideas and designs. We would like to thank our November host, Jennifer Meyer and welcome our December host, Jenny Gropp. 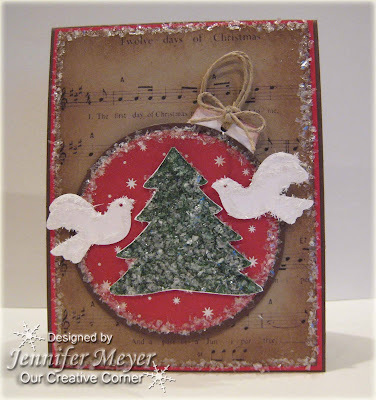 Jenny has challenged the OCC to the Twelve Day’s of Christmas. 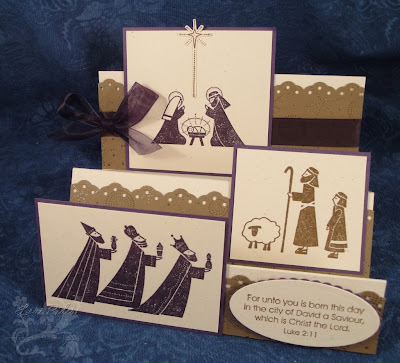 We also have a PRIZE for this challenge... A $25 Gift Certificate from Prickley Pear Rubber Stamps is up for grabs. The winner will be selected randomly from the challenge players listed in Mr. Linky, and the winner announced on the next Saturday's Challenge, December 12th. Big thanks to Nicole at Prickley Pear for hosting this week's Challenge with a gift certificate! 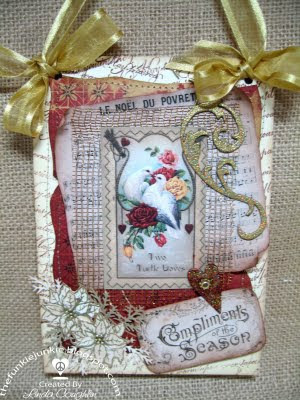 We also have Carol Cabezas as a Guest Designer today, Thank you Carol for playing along with us for this challenge. 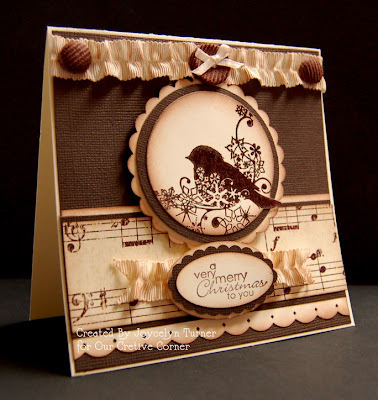 You can find more of Carol's inspiring and amazing creations on her blog ScrapJust4Fun. 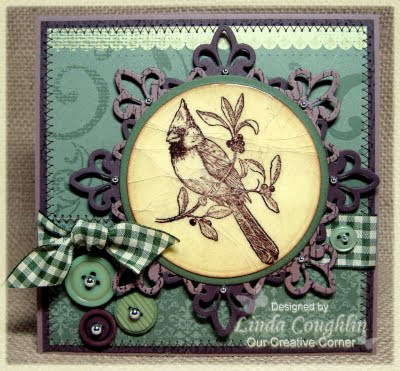 Here is Carol's creation for this week: Her inspiration was the line "Four calling Birds".